Spindleruv Mlyn is a popular ski resort in the Czech Republic. In Spindleruv Mlyn you can find about 85 kilometers of unforgettable trails, 25 kilometers of ski slopes and 4 wonderful snow parks. The Ski resort Spindleruv Mlyn is equipped with a modern snow-making system, which even in bad weather can quickly cover the ski slopes with artificial snow. Medvedin, Přední Planina, Hromovka and Mechovinec are mountains, on which the ski resort Spindleruv Mlyn is situated. Their snowy hills offer a choice of slopes diversity and difficulty, e.g. Horni Misecky, Labska ski resort, Ski resort Svaty Petr, Hromovka. So each skier will definitely choose. Information about the operation of ski lifts, condition of the slopes and trails, snow parks, ticket prices and other valuable daily updated information for visitors during the winter season. Medvedin = “Sunny mountain, which touching the clouds”. The highest ski resort (1235 m) in Spinderuv Mlyn. Red trail (total length 2.3 km) with a new face up to 60 meters wide, is moving to the forefront of the broadest slopes in the Czech Republic. Neither the black slope stays in the background as new extensions and newly installed security features attracts experienced skiers. Small area with countless possibilities. Excellent moderate and wide blue runs (total length 1.3 km + practice field for beginners 0.3 km) for children and beginners. Here are born new skiers and snowboarders. Horni Misecky resort is directly connected to the slopes of the Medvedin. Red trail (total length 1.8 km), which is located near the river Elbe and dam at the beginning of Spindleruv Mlyn. Smaller, peaceful resort is popular mainly families with children. The area is connected with the ski resort Horni Misecky. The most popular area is the scene of many major sporting events in the Czech Republic. “Svaty Petr is something for everyone”. From long wide blue trail waiting for beginners, to black FIS World Cup for expert skiers. 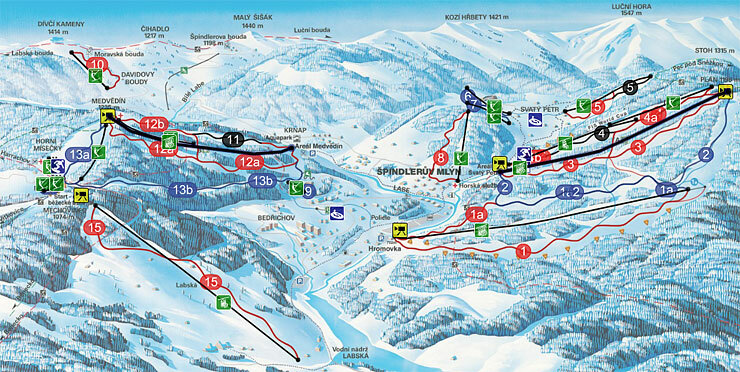 The gateway to the world of skiers and snowboarders in the ski resort of Spindleruv Mlyn. Pretty long red ski slope rugged sought primarily by experienced skiers. The aim of enthusiasts of one of the longest night skiing in the Czech Republic.